An award-winning Tees tech firm is leading the rise of the robots as it prepares to launch an artificial intelligence system its directors describe as “the cutting edge of cutting edge”. Stokesley-based Applied Scientific Technologies is forecasting a 10-fold increase in turnover to £4m within two years. The firm is currently preparing field trials that will see its “revolutionary” custom-built robotic automated systems go into full production within months. And directors Jamie Marsay, Garry Lofthouse and Lee Raywood are targeting sales of 50 a year of the patent-pending innovation by 2020. Just a year after launching, Applied Scientific Technologies (AST) has already won orders from corporate global giants – with many more “banging at the door” – for a robotic scientist its creators call The Hyve. Such is the ground-breaking advancements of the autonomous robotic system compared to anything else available on the global market that two of the same world-leading firms have helped to fund research and design on the cutting edge technology. AST’s first sale was to the European HQ of a multi-national personal care company who plan to roll out the The Hyve product across their global operations. But global innovators within the health care, pharmaceuticals, food and beverage, life sciences and personal and household care markets are queueing up to be next. Now Applied Scientific Technologies is set to give The Hyve its European launch in September before launching the industry-transforming innovation to the rest of the world in 2019. Mechatronics expert Jamie Marsay said: “We’ve been told by people in the know that it’s unbelievable and that it’s a step change but the best compliment I ever get is that it’s too good to be true. Such is the success that the firm is bringing to market that its first 12 months has been heralded by winning the Innovation category in the North East Business Awards. Along with staff at established sister company Applied Integration, AST’s directors are working shoulder-to-shoulder with forward-thinking global giants including digital pioneers Siemens UK as their strategic partners. Marsay added: “These world-leading firms have paid for The Hyve’s beta model so they can work on the field trials for this innovative new product, knowing there will be some teething troubles. AST plan to open a production facility for The Hyve in the Tees region within the next six months. “I know this market well and it’s massive,” said Marsay. “I’ll be very disappointed if we don’t achieve at least a 10-fold increase in turnover by 2020 as we take the business to production scale. He revealed that AST is planning the commercial launch of The Hyve with detailed precision to ensure they can meet the demand they know is there. He explained: “We’ve tried to keep the details of our innovation hush-hush but people in the know who have heard what we’ve got are banging on our doors. “That’s because they know we’re set to transform the industry. Leaders in the field have been resting on their laurels for too long. “But we’ve been determined to wait until we’re absolutely ready before making The Hyve available. We plan to make the best possible product available ‘off the shelf’. AST is currently looking to recruit a multi-disciplined chief engineer and several apprentice engineers. Marsay added: “We are looking for good people including a senior engineer– and apprentices, too, because we have to grow our own robotics engineers as there aren’t too many of them about. “Working at AST will all be about creativity and free thinking so that we give people the opportunity to succeed and to fail. We want them to be the vision, develop and drive forward some of the stuff that would be knocked back elsewhere because it’s not immediately commercial viable. 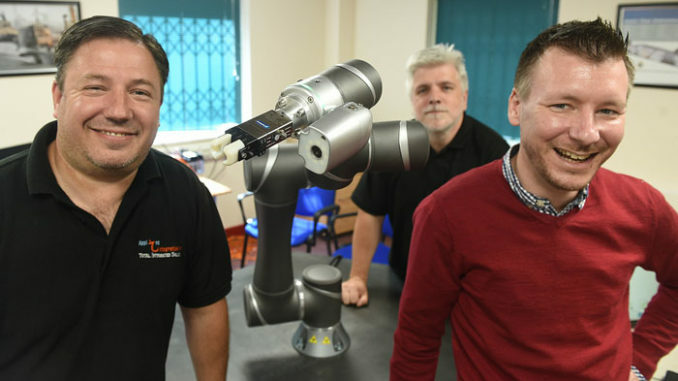 • Pictured above: Applied Scientific Technologies directors, from left, Garry Lofthouse, Lee Raywood and Jamie Marsay say their robotic automated system will revolutionise the robotics industry.